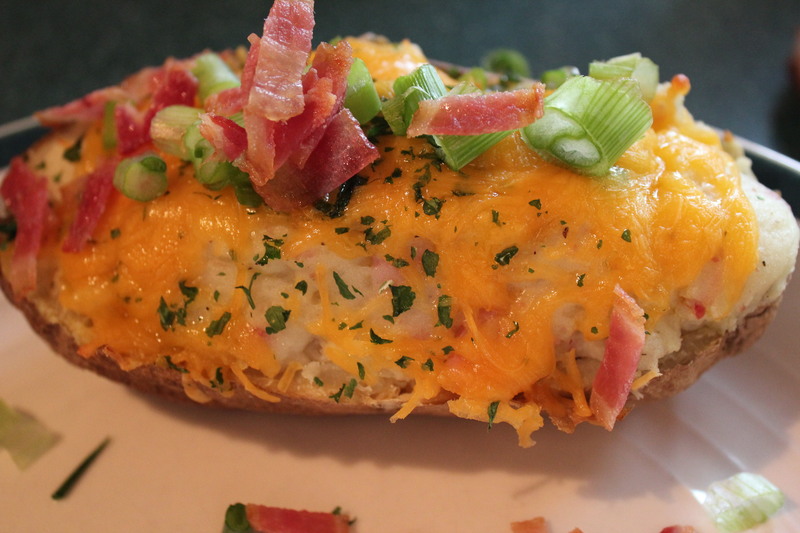 Who does not like Twice baked potatoes‘? You can eat them alone, with a salad or as a side dish to your meal. You can use them as appetizers by cutting them in half when finished. Very easy and a nice way to present the potato yet again! Rinse the potatoes well with cold water. Using a sharp knife poke 6-7 holes in each potato. Bake the potatoes in the oven at 350 degrees for approximately 1 hour (depending on their size) or until tender. You can also cook them in the microwave for around 15-20 minutes depending on their size and your microwave. (keep an eye on the microwave they can become hard and unusable! While the potatoes are baking chop the ham slices and cooked broccoli into small pieces. Once the potatoes are fully cooked remove them from the oven and carefully cut them in half lengthwise. Using a clean kitchen towel to protect your hands scoop the flesh of the potatoes into a large bowl and add the ham, green onions, broccoli, sour cream, butter, salt, and pepper. Using a potato masher, mash the mixture together until it reaches the texture you like. Return the mixture to the potato skins, top with cheddar cheese, place them on a baking sheet, and bake in a 350 degree oven for 15 minutes. I also added bacon and sour cream to mine when they were done.